The normal ageing process results in a reduction in collagen in the deeper layers of the skin. Smoking and exposure to sunlight can accelerate this process, causing thinning of the skin. The action of the underlying muscles then causes vertical wrinkles, which over time become permanently ingrained in the texture of the surface of the skin. Botox can only be used for minor lines and can only be given in tiny doses, otherwise, a droopy lip will result. Dermal fillers such as Restylane or Juvéderm are a more satisfactory option for multiple peri-oral lines, but of course, this treatment is temporary and will need to be repeated on an annual basis. Chemical peels may be used, but unless administered in a very concentrated form, they often only provide benefit for only the most superficial lines. Dermabrasion has historically been the most widely used treatment method – and now carbon dioxide laser resurfacing has replaced dermabrasion as the most effective permanent form of resurfacing method. 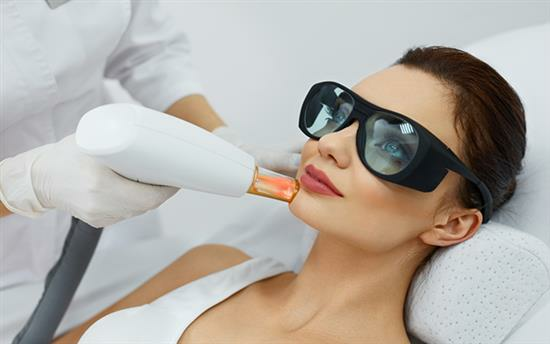 This device, specifically, uses a laser beam to penetrate deep into the skin in a grid-like fashion, leaving tiny areas of normal skin untouched in between each laser treatment spot. The penetration of the laser energy under the surface of the skin generates new collagen formation and the untreated area in between acts as a nidus for healing. The new collagen helps to rejuvenate the skin and smooth out the lines. The fractional mode of the laser reduces the healing time. Mr. Chana is one of the few plastic surgeons fully incorporating laser resurfacing into his surgical practice – benefiting both patients wanting non-surgical options and patients undergoing surgery such as facelifts. What anaesthetic is required for Fractional Carbon Dioxide Laser Resurfacing around the mouth? Treatment of a confined area such as the upper and lower lips can be performed under local anaesthetic. There is no pain and only a few patients describe mild discomfort after the treatment. The treated skin will crust and develop redness, which will persist for approximately two weeks. During this time a topical antibiotic cream is provided which helps to keep the area moist and helps prevent infection. An anti-viral medication is also prescribed. After two weeks makeup can be applied as usual. Strong sun exposure should be avoided for 3 months following treatment, or factor 50 sunblock should be used. If the laser treatment has been deep, some redness may persist for up to 6 to 8 weeks following treatment. Mr. Chana will advise on the likely healing period in each individual case. Occasionally some patients may require a second treatment either because there are some residual lines or because a mild treatment was deliberately planned in order to keep the recovery time short in the first place.